Shop for home and gift accessories and choose from a variety of choices including clocks, plaques and decorative bits and pieces. Iron 12 bottle wine rack. 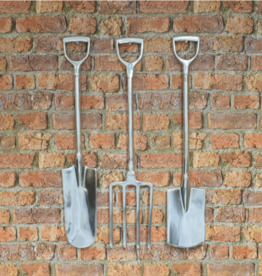 All made of welded iron with a neat wooden handle. Metal framed clock reminiscent of an old-fashioned weighing scale. H:26 x W:19 x D:19 cm. 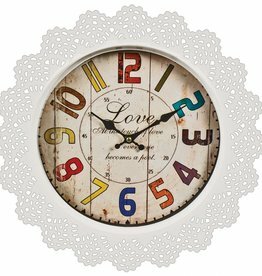 Cream wall clock with a faux wooden panel face. H:51 x W:51 x D:13 cm. Home Sweet Home wall clock. A beige metal wall clock with a silver rim perimeter. H:47 x W:47 x D:10.5 cm. Cafe de la tour silver wall clock. Silver metal wall clock with a white face. H:47.2 x W:47.2 x D:6.1 cm. Eau de quinine tonique wall clock. A cream metal wall clock with French text. A cream metal casing with a cream clock face. A pretty multi coloured clock face surrounded by metal lace finish effect. 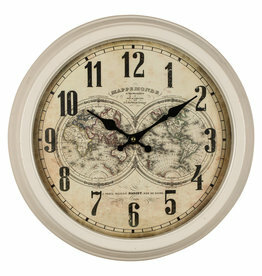 The clock face is cream and depicts two maps. H:40 x W:40 x D:9.5 cm. A large gunmetal grey wall clock . H:52 x W:52 x D: 8 cm. Chrome with black face clock. H:31 x W:31 x D:9 cm. Set of 4 playing cards coasters. H: 30 x W: 40 cm. Hammered industrial mirrored clock with copper detail. A beautiful furnishing that is sure to bring an impact into any room. The Genoa chrome tripod floor lamp. A stylish addition to any room. H:160 x W:48 x D:48 cm. Round wall clock with chain. Classical french design with an industrial appearance. Bistrot de Paris tall wooden wall plaque. 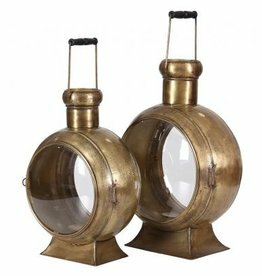 Railway leather furniture set of 2 lanterns. An addition to any home. 37 x 22 x 55 cm. 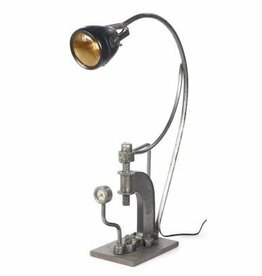 Includes lamp with gauges and bolts. 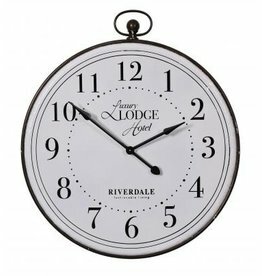 Luxury lodge hotel large round clock.